Tracee Ellis Ross, the daughter of a legend and an icon herself, made the sensible choice to go “shopping” in her mom Diana Ross’ closet as a child. So did you borrow clothes from your mom? Because your mom must have had an archive to end all archives. Lynn, you’re very kind to say did I borrow clothes from my mother. It sort of was more like stealing. I’m not going to lie. She would leave the house and I went in her room and looked out the window and saw her car go down the driveway, and I marched myself right into her bathroom and started taking clothes. What I liked to do is put them in my closet and live with them as if they were mine. And my mom walked back in the room, in the bathroom. [Laughs.] And she was like, “What are you doing?” I was like, “I’m organizing your closet for you! What are you doing?” She said, “I forgot something.” And I was like, “Oh! Can I help you find it?” [Laughter.] So, yeah, I, I was known for that. And still I call it shopping. I go to my mom’s house—my mom has the most extraordinary taste, top to bottom, whether it’s the dishes or the clothes, from t-shirts to gowns to hats to coats. I call it shopping, and to this day whenever I go over to my mom’s I sometimes look at my brother, Evan, and I’m like, “Should we go shopping?” And I will ask if I can take something and she always says, “No.” My mom will say “no” often. She will give me anything, give us anything off of her back, but sometimes she’s like, “For god’s sakes, leave my mirror alone!” You know. I know. The rest of the Q&A focuses on her nuanced role on black-ish (“I am interested in playing the kinds of women that I see and know in the world,” she says), early acting gigs, TV crushes (Jason Bateman), etc. The cover image, meanwhile, feels like a fresh throwback to her modeling days. 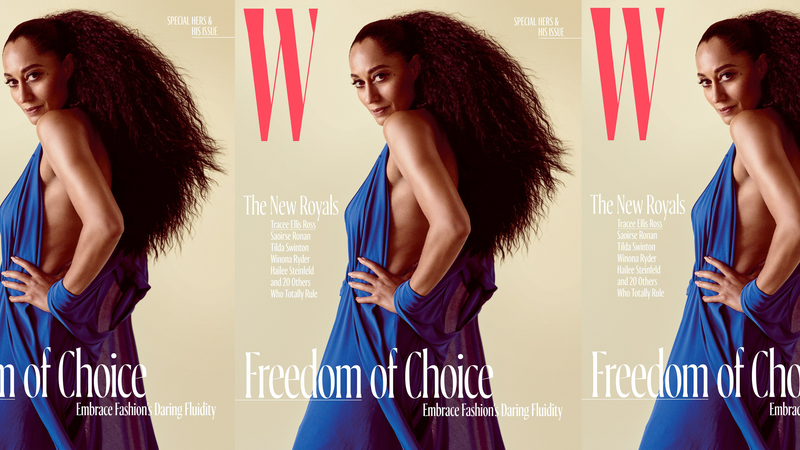 W also shot covers with Tilda Swinton, Winona Ryder, Chris Hemsworth, Hailee Steinfeld, Robert Pattinson, Jared Leto, Saoirse Ronan, James Corden and Pharrell Williams, as part of its New Royals lineup.